Jamie Vardy then capitalised on awful defending to twice put the Foxes ahead either side of Danny Welbeck's equaliser before Arsene Wenger sent on the cavalry. 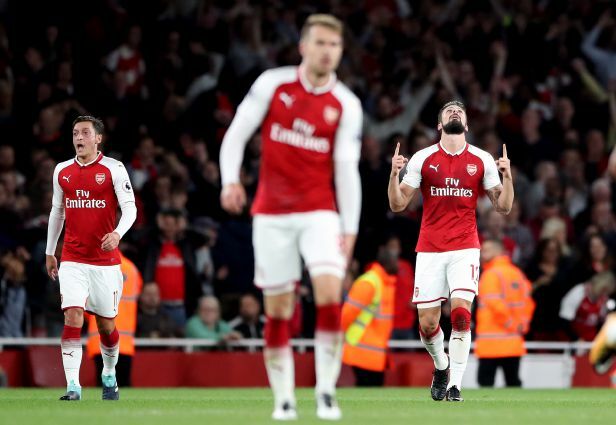 Substitute Aaron Ramsey rifled home to level before Giroud – introduced alongside the Wales international - headed in an 85th-minute winner to settle a breathless encounter in Arsenal's favour. Lacazette converted his first chance in the Premier League, heading home Mohamed Elneny's inch-perfect cross to send the home fans into raptures. But Arsenal's defence, with essentially two full-backs playing in their back three, were soon caught out having been given a warning when want-away Leicester winger Riyad Mahrez volleyed wide. Petr Cech was largely at fault, coming off his line but getting nowhere near Marc Albrighton's deep cross as Foxes debutant Harry Maguire headed back across goal for Okazaki to nod in. Sead Kolasinac marked his debut with a goal in the Community Shield and forced Kasper Schmeichel into a smart save here with a driven shot from just inside the box, but the Gunners again fell behind to Vardy's strike. Okazaki nearly made Arsenal's first half even more galling but he could only head narrowly wide with the home defence all over the place. Mahrez saw an effort tipped over by Cech as Leicester looked to regain their advantage – something they did from the resulting corner as Vardy, completely unmarked, headed home the Algerian's set-piece. 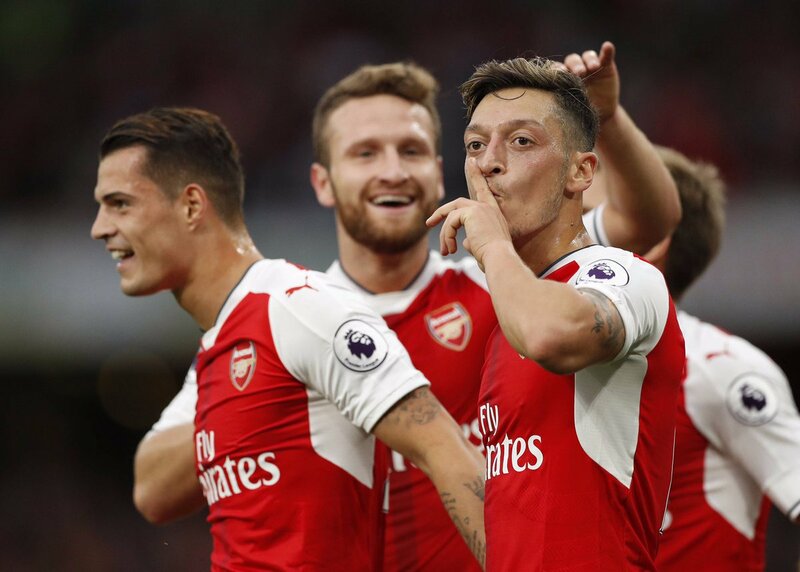 With time running out, Ramsey made sure he did not make the same mistake as he fired past Schmeichel from Xhaka's pass with eight minutes remaining. There was, however, a strong suspicion of handball by Ozil ahead of the corner that indirectly led to the goal. Schmeichel's brilliant diving stop denied Lacazette a fourth but, from the corner that followed, Giroud headed home off the underside of the crossbar to seal a remarkable three points.